Miqra `al pi ha-Mesorah is a new experimental edition of the Tanakh in digital online format, now available as a carefully corrected draft of the entire Tanakh. Two features make this edition of the Tanakh unique: Full editorial documentation and a free content license. Full editorial documentation: Various editions of the Torah or Tanakh in Hebrew may seem identical to the untrained eye, but the truth is that each and every edition—from Koren to Breuer and from Artscroll to JPS—makes numerous important editorial decisions. In most editions these decisions are not transparent, and the student of Torah therefore relies upon the good judgment of the editor. But in Miqra `al pi ha-Mesorah the entire editorial process and the reasoning behind it are fully described in all of their details: Every stylistic alteration and every textual decision made regarding every letter, niqqud, and ta`am in the entire Tanakh is documented. . . . Categories: Public Readings, Sources, and Cantillation, Targumim (Translations) | Tags: JPS, 20th century C.E., JTS, TaNaKh, English Translation, targum, 57th century A.M. The 1985 JPS may be on the Amazon best seller list but it won’t be until 2080 before its contents enter the Public Domain. 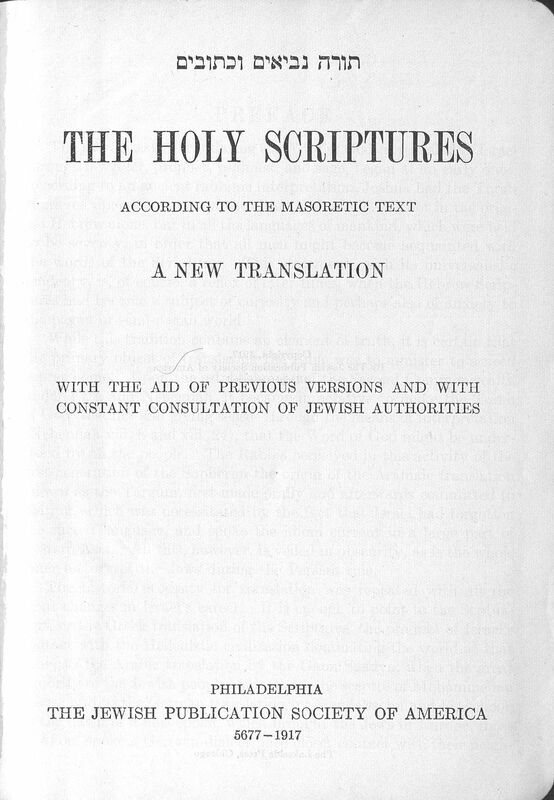 Thankfully an excellent English translation of the TaNaKh already exists that we can use, modify, and importantly, update: The Holy Scriptures According to the Masoretic Text: A New Translation with the . . .